I recently had the opportunity to start fresh with a new Rails app. Instead of building another traditional Rails app I took this chance to investigate using some modern tools like Webpacker and a modern CSS framework Bulma. In this post I’ll explain how I got everything wired together. Yarn claims to be “Fast, reliable, and secure dependency management” and it really is. To use icons in Bulma you need to include Font Awesome. This is basically copied from the Bulma examples. It is a basic nav bar with two menu items; Home and About. We now have all the pieces in place and can start wiring up our Stimulus controllers. To keep this example simple, we’re going to create a single controller which we’ll attach to the body tag in the main layout. This controller will be responsible for rendering the Font Awesome icons (as described in a previous post) as well as handling our Bulma burger menu. // Toggle the class on both the "navbar-burger" and the "navbar-menu"
This controller imports the icons from Font Awesome when initialize is called. Everytime connect is called it renders the icons and then searches for navbar burgers to attach the appropriate click events on. Now we want to connect the body tag to our controller using an HTML5 data attribute. 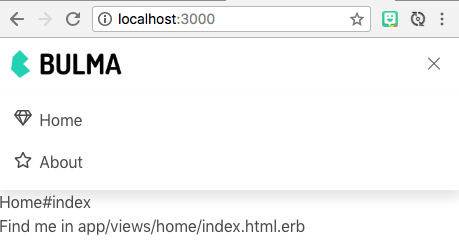 Open app/views/layouts/application.html.erb and add the following attribute to the <body> tag.